PaperTrue's editors improve and polish the quality of language and grammar in any English document, to ensure it is error-free, polished and impactful. Our editing and proofreading services are specially designed for students, authors, job applicants, businesspersons, and speakers of English as a second language (ESL). Your documents are edited by native English language experts who have knowledge of a variety of academic and professional fields. For more information about our services, please visit the Services section. You can also view this video. Who will edit and proofread my document? Your document is professionally edited and proofread by language experts who are native speakers of English. Our editors specialize in refining documents from a wide range of professional and academic fields, so you can be assured that they are qualified to expertly improve your document according to your requirements. How will you edit and proofread my document? Your document will be carefully edited to enhance its style, structure, coherence and clarity. In addition, we will thoroughly proofread your document to correct all errors in grammar, spelling, punctuation and typography (typos). Our editors will make sure your formatting requirements are consistently followed. Further, we will check your references for conformity with guidelines such as the APA, MLA, Harvard, Chicago, IEEE, OSCOLA and MHRA styles, or any other guidelines that you provide. 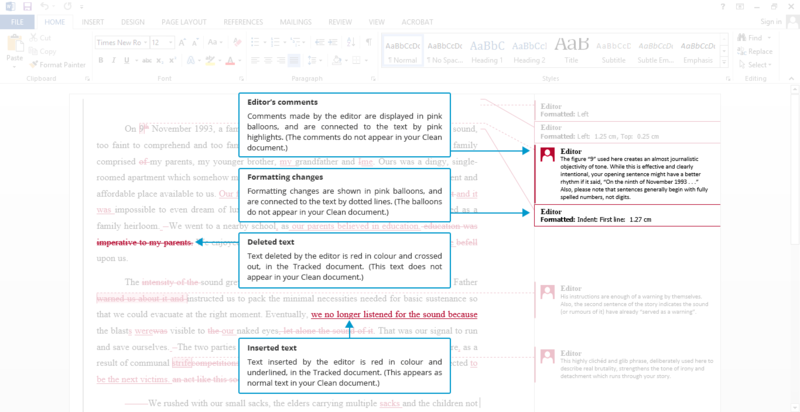 Your document will be edited using Microsoft Word's Track Changes feature. This easy-to-use feature records our editors' insertions, deletions, formatting changes and comments, and enables you to accept or reject each modification made to your document. I'd like to try your services. Do you offer a free sample? Yes, we do. Just click here to get your free sample edit now! You will get 300 words of your document edited free of charge – and you'll be impressed with our careful corrections and in-depth feedback. What types of documents do your editors work on? We are equipped to refine every type of document! Our experienced editors specialise in working on documents from diverse academic and professional domains. Whether you've written an academic paper, a job application, a business document, or a novel, we will carefully assign your document to the right editor for the job. You can be confident that your document will be in good hands! Will you do the referencing for my academic document? Yes, our editors are experts in referencing, with in-depth knowledge of several referencing guidelines such as the APA, MLA, Harvard, Chicago, IEEE, OSCOLA and MHRA styles. We will make sure your references are accurately and perfectly formatted. Will you write the document for me? Will you perform research and add content? No, our editors will not write your document or create new content for you. Because we respect the message you intend to convey and the academic integrity of your research, our policy is to refrain from creating or changing the essential content of your document. What our editors will do is carefully refine your document and bring out the full impact of your ideas. You will see that with our help, you can create an impactful and flawless document! Will you rewrite or paraphrase my document? No, we will not rewrite or paraphrase your document. As professional editors, we respect the integrity of your ideas and the message you intend to convey. Therefore, our policy is to refrain from making heavy changes that might alter your document’s essential content, which includes rewriting or paraphrasing your work. What we certainly will do is ensure your existing content is error-free, impactful and perfectly edited! Does my university allow students to use your service? Yes, most universities certainly allow students to use editing and proofreading services. In fact, many professors encourage students to have their academic papers professionally edited and proofread before submitting them. It's always a good idea for a student to get help from a skilled editor. One of the edited documents has red text, comment balloons and highlights. What are those marks and how do I remove them? Your document has been edited using Microsoft Word's Track Changes feature. This easy-to-use feature shows you a record of all the changes we have made to your document, so that you can accept or reject each change. The Tracked version of your document shows all the changes we have made in the text and formatting, as well as detailed comments and feedback from our editors. Here is how to decode the editing marks: All text that we have modified is underlined. Additions made by our editors as well as erased words are red in colour. Finally, comments are displayed in pink balloons, and are linked to the text by pink highlights. To see examples of the editing marks, please view this image. The Clean version of your document contains exactly the same edited content as the Tracked version, but does not contain any editing marks. If you are finding the marks a little too confusing, you could ignore the Tracked version and refer to only the Clean version. Click "Upload Document" and select the document that you want us to edit and proofread. You will now get the price quote and turnaround time (you'll be pleasantly surprised)! Create a new PaperTrue account or Sign In with your existing account. You can now make the payment using your credit card, debit card or PayPal account. After this, you will see the payment confirmation and job summary. Download your edited document from the My Jobs page in your Account. When your error-free and perfectly edited document is available for download, we will send you an e-mail notification. Sign In at any time to view the status of your order! How will you return my edited document? After you place your order using our simple online process, you can sit back and relax! We will notify you by e-mail when your edited document is ready. You can then download your expertly edited document from the My Jobs page in your PaperTrue account. What kinds of file formats do you accept? We work with document formats of every type, including .docx and .doc (MS Word documents), .odt (Open Document Text files), and .txt files. We also accept other formats such as .pdf (Adobe Acrobat documents) or image files – please Contact Us by chat, telephone or e-mail if your document is a .pdf file or image. If you would like to cancel your order, please Contact Us by chat, telephone or email. Your order will be cancelled immediately, and you will receive a full refund of the payment amount. Please note that our editors start working on your document very soon after we receive your order. Therefore, you can only cancel your order for a refund within thirty minutes of placing the order. How do I delete a job I have created? In My Jobs, click on the job which you wish to delete. This will take you to the Job Summary. Click the Delete icon ( ) in the top right corner of the Job Summary. Please note that doing this will delete all the files under your job, including the edited documents. I uploaded the wrong document! How can I replace it with the right one? Did you upload the wrong file? No problem. Just Contact Us by chat, telephone or email, and we will ensure our editors process the right document. You can cancel your order for a 50% refund. If you contact us more than 24 hours after placing your order, we will not be able to process a refund or replace your document. However, we will be glad to continue editing your original document. How quickly will I get my edited and proofread document? We return most of your documents within a turnaround time of 24 hours. Needless to say, if we finish processing your job before the stated delivery time, we will upload the edited document immediately. To get the exact turnaround time for your document, please visit our Pricing section or upload your document by clicking View Pricing and Order Now. What days of the week are your services available? Do you work on weekends? Yes, we do work on weekends. To ensure you never miss a deadline, our services are available to you 24 hours a day, every day of the week! Our pricing is based on the word count of the document you upload, and our prices start as low as £38 per 1000 words. Please visit our Pricing page to get the price quote for your document. You can make the payment online using your debit card, credit card or PayPal account. All your payments are securely processed via PayPal, the globally respected payment gateway. Keep your Discount Code ready! Click View Pricing and Order Now to get started. Upload your document and give us your editing requirements. On the Review Job page, click on Have a Discount Code? Enter your Discount Code in the box, and click Apply. You will now see your special discounted price! Make the payment to finish placing your order. After this, you will see the payment confirmation and job summary. Download your finely edited document from the My Jobs page in your Account! To make sure that your information is always protected, we use 256-bit SSL encryption technology to transfer data between your computer and the PaperTrue website. You retain full copyright control and credit for your edited documents. PaperTrue never collects or shares your information, and we never store your documents without your permission. Please see our Privacy Statement for further details. How do I know my payment and transaction details are secure? All your payments are processed via the globally respected payment gateway PayPal. To ensure the security of your transactions, PayPal uses industry standard data encryption to protect all your information. Payments made using their system are guaranteed to be safe. If I am not satisfied with your service, how can I request a revision for my order? In the rare event that you are not satisfied with our service, we will promptly revise your document according to your requirements, for no extra charge. Please e-mail us requesting a revision at [email protected]. Kindly mention the Job Number, and give us your feedback about the edited document. Please note that we do a free revision only if our editing has not met your expectations, and you clearly specify how we can further improve your document. Revision requests must be made within 30 days of receiving the completed order. For further details please visit the Terms and Conditions page.